, we are back again to talk in more detail about how Search Funnels interact with your account and give you powerful conversion data. We will also take a quick look at the kind of reports you can generate using search funnels. Search Funnels tracks all of the search ad impressions and clicks for users who convert (which may mean a sign-up, a donation etc). For each conversion, your user’s search ad history is ‘stitched together’ to form the basis of Top Paths and other Search Funnels reports. This history currently defaults to 30 days prior to conversion and for now, it isn’t customizable. The data is based on cookies, which means that users who clear cache and cookies will yield artificially short funnels. Because Search Funnels do not cross device boundaries, a user who works on more than one computer/device/browser may appear to have shorter conversion paths. Conversion data on Search Funnels differs from AdWords conversions data because in all Search Funnels reports, except for the “Assist Clicks and Impressions” report, the conversion count is based on actual conversion time. For the “Assist Clicks and Impressions” report, impression time is taken into consideration (the time of the ad impression that was clicked immediately preceding the conversion). Using Search Funnels reporting helps you set benchmarks for your org's specific goal conversions. The time between a click on your ad until the conversion is achieved on your site may tell you how the user has interacted with your website. You can use this data to create better ads or tailor your website to be more user-friendly and navigable. Search funnel reports also tell you which keywords give you the best converting clicks, help you create awareness for your organization and optimize your search campaigns for better performance. Check out this AdWords Help Center article to determine how your organization's metrics can be tracked with Search Funnels reports. In addition to a Top Conversions report, Search Funnels consist of 7 other reports. Top Paths: Ads that were shown and/or clicked leading up to a conversion. Assist Analysis: Performance based on how many assisting clicks and impressions there are for each keyword, ad group, or campaign. Assisted Conversions: Performance based on how many conversions were assisted by each keyword, ad group, or campaign. 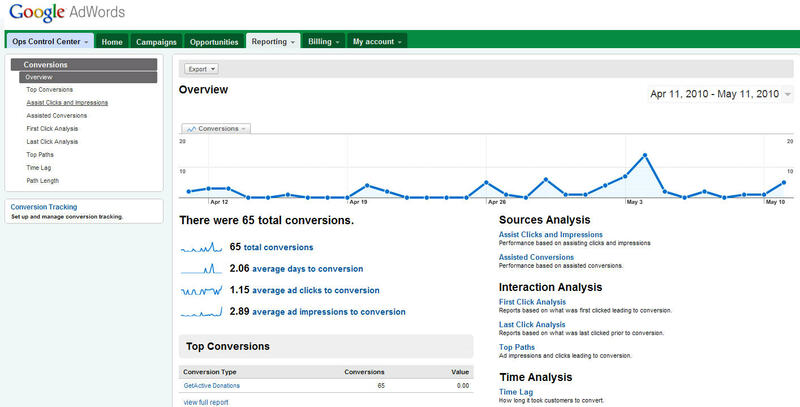 First Click Analysis: Lets you filter conversion reports based on what was first clicked leading to conversion. Last Click Analysis: Lets you filter conversion reports based on what was last clicked prior to conversion. Time Lag: How long it took your customers to get to conversion from first seeing your ad. Path Length: How many ad clicks or impressions it took your customers to get to conversion. The final post in this series will wrap up with how to put the reports into action for your organization. After the quick introduction to Search Funnels reports that we did last time, we are back again to talk in more detail about how Search Funnels interact with your account and give you powerful conversion data. We will also take a quick look at the kind of reports you can generate using search funnels. , every month I will be highlighting a popular topic from the Google Grants discussion forum and clarify the concerns on this blog for the wider audience. This month, a popular topic in the forum has been the Account Review process. For background, after a non-profit’s application has been screened and accepted, an email invitation is sent with instructions on how to build a Google Grants AdWords account and submit it via webform when it is completed. AdWords specialists then review the account to ensure that it is set-up for success and activation. This entire process is the Account Review process. In the discussion forum, there have been a few posts regarding the timing of the Account Review process, and about making corrections to the AdWords account based on feedback from the AdWords specialists. As mentioned in the Google Grants Help Center, on average, accounts will be reviewed within 3 weeks of submission. However, since account review submission volume can fluctuate, it could take up to 30 days to be notified of the status. If it has been more than 6 weeks since your account has been submitted, you can contact our team via our webform to find out the status. A few grantees have started discussions in the forum wanting clarification on how to submit corrections for review and how to address corrections that are required for activation, but have been submitted correctly. If you received an email from our team requiring that you correct errors in your account, you need to make the adjustments, and then reply back to the email you received to notify your reviewer. This email will go directly back to the specialist working on your account, and he/she will re-review and activate if all changes have been made. Please make sure to include your ten-digit customer ID in your email, as it will speed up the re-review process. There could be an instance where your account was inaccurately flagged for review for a specific category. If this is the case, please quickly double check your account for this requirement. If it does not need to be fixed, just reply back to the email and mention this potential error to the reviewer. Since the review process is manual, errors can happen. We will do our best to rectify the error and activate the accounts in a timely manner. We thank you all for your patience and hard work when building, submitting, and updating your AdWords accounts. And please keep the discussions coming! As mentioned in my previous blogpost, every month I will be highlighting a popular topic from the Google Grants discussion forum and clarify the concerns on this blog for the wider audience. We’ve discussed Google Analytics before and have shared a number of great resources with you, but let’s take a closer look at some reports that help you learn more about the types of visitors your website receives. The ‘Visitors’ reporting section of Analytics shows you where visitors to your site are located geographically, and helps you understand user behavior in terms of trending (how deep into your site they go and for how long), and loyalty (whether they come back and how often). If you’re curious about where your visitors are located, you’ll want to spend some time using the Map Overlay report. Not only can you visualize what countries, states, and even cities your visitors come from, you can use this information to improve location targeting in AdWords, customize ad text to speak to users in different locations, and understand which areas have historically been the most successful for your organization. I also love pairing data from the Map Overlay report with data from Insights for Search to see where there’s additional opportunity to reach the desired users. You can look at Insights for Search for some of your organization’s most important search queries and see how interest in those terms is indexed in different locations. We recently discussed using Insights for Search to manage seasonality. By comparing the data you see there to the volume you’re currently getting on your site from different geographic areas (again, through the Analytics Map Overlay report), you can pinpoint which geographic areas or cities might be good places on which to focus in the future. Whether your goals are to drive additional awareness, look for new markets in which to grow your presence, share your resources and knowledge with more people, or recruit volunteers, make sure you’re using all the data available to you to make those decisions. 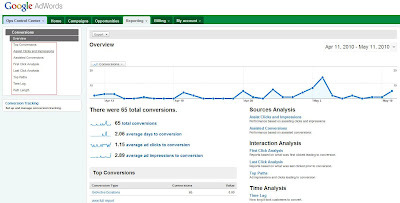 For additional Analytics resources, you can view quick 60-second tutorials or watch other short videos on leveraging AdWords data paired with Analytics reports. Regardless of whether you’re sending traffic to your website via AdWords, if you’re getting any traffic on your site it’s important to keep track of it, and with Google Analytics that’s free! and building a free set of powerful tools to help you change the world. Improve your work practices, avoid IT hassle, and facilitate your interaction with your users by using Google Apps for non-profits. Learn the specifics on how to use GMail, Calendar, Docs and more by watching this video. Check out how Mercy Corps used Google Apps to improve their day to day operations. Increase donations for your cause by using Google Checkout for Non-Profits. It’s a fast, convenient and secure way to collect online donations and increase online giving to your organization. Direct Relief raised money and online support by providing users all over the world an easy way to donate through their Google Checkout account. Get Google Analytics to track and understand your online users and adjust your online presence to fit their needs as well as yours. Google Analytics data can help you convert more of your users into donors and make strategic decisions to drive more traffic to your site. Read New York Public Radio’s story on how Analytics improved their understanding of their users and drove strategic decisions on their team. YouTube’s non-profit program offers you the opportunity to spread the word while engaging and attracting more supporters online. Video is a powerful tool that can help you effectively reach out and energize your base. For example, by adding the Call-to-action overlay on your videos, you can drive traffic directly to your cause. Charity : water recounts their fundraising efforts in this video. They were able to raise $10,000 for clean water in one day! The Google Grants program empowers your org to achieve its goals by helping you promote your websites via advertising on Google.com. Your ads appear when users search on Google.com. For example when you search for "world poverty" on Google.com, relevant text ads appear on the right hand side. Clicking on one of the ads brings users directly to the website being advertised. You can be that website by participating in the Google Grants program. Are you a social entrepreneur? Do you want to start your own non-profit? Running a socially-conscious business or non-profit is a challenge, and none more so than today. Not only is outreach expensive, but IT maintenance can be a real drain. Google is here to help! Google is dedicated to helping non-profits, devoting 1% of its equity and yearly profits to philanthropy and building a free set of powerful tools to help you change the world. Search Funnels are a set of new reports describing the Google.com search ad click and impression behavior that leads up to a conversion. Right now, conversions in AdWords are attributed to the last ad the user clicked before the conversion occurred. However, many users perform multiple searches before finally converting. Search Funnels helps you see the whole picture by sharing insights into the ads and keywords that users interacted with before converting. Conversions reported in this tool are tracked by the AdWords Conversion Tracking tag or are imported from Analytics after linking your AdWords and Analytics accounts. Search Funnels shows you data on clicks and impressions that assisted conversions and as a result, show you which of your keywords, ad groups and campaigns are adding more value to your online advertising efforts. It also helps you decode the behavior of your users and use that data for your online and offline advertising strategies. Direct Relief has an AdWords Grants account. They are generating donations through their gift catalog that will provide humanitarian assistance around the world. A user searches on “charity greeting cards”. They see Direct Relief’s ad and click on it. A click is registered in Direct Relief’s AdWords account. Two days later, the same user searches for “unique mother's day gift ideas” and see another ad by Direct Relief but do not click on the ad. An impression is registered in Direct Relief’s AdWords account. Finally, four days later, the same user searches one more time but this time for “Direct Relief”, sees their ad, clicks on it, visits the site and makes a purchase from their gift catalog. A conversion is registered. Instead of showing a conversion for just the keyword, “Direct Relief”, the Search Funnels report shows an assist click for the keyword “charity greeting cards” and an assist impression for the keyword “unique mother’s day gift ideas”. Testing the value of assist clicks and impressions helps you understand the true value of your keywords so that you can set your Max CPCs accordingly and optimize your keyword lists and conversion goals to be most effective and representative of your users’ actual behavior. We'll be posting the second part of the Search Funnels Report series soon, but in the mean time, here’s a video that talks in more detail about Search Funnels. We’d like to introduce a new reporting feature in AdWords called Search Funnels. This will be the first in a short series of posts walking through the features of this report that’s especially useful for accounts already using conversion tracking or linked to an active Google Analytics account. so that we could begin to offer your knowledge combined for the benefit of the greater non-profit community. We’re pleased to say that there has been a great response. You have incredible stories and advice! Want to increase donations or leads? If your organization is working toward brand awareness, increasing donations or leads, general cause awareness, volunteer recruitment or just getting started with AdWords, there is a real-life grantee story and advice on conquering these and other hurdles on the testimonials page. If you get through all the stories and want to discuss more, try the Discuss link from the bottom of the page and link up with other grantees working toward similar goals. If you’re inspired to share a Grants, AdWords or Google success story for your organization, we’d love to hear it! Just hop over to the Share Your Story page and tell us what your org has been able to achieve. Back in November of last year, we announced our testimonial resource and submission form so that we could begin to offer your knowledge combined for the benefit of the greater non-profit community. , people around the country are paying even closer attention to air quality and what they can do to improve it. A few Google Grantees have resources you can use to make changes in your daily lives to improve the air quality where you live. Download the American Lung Association’s “State of the Air Report”, check out your city’s ranking on their air quality Report Card, find out how to combat hazards that exist at work, home and outdoors and get involved to work toward clean air. The Environmental Defense Fund covers Bike to Work Week (5/17-5/21) and includes stories from a variety of people who have swapped their cars for bikes for their daily commute. If you’re considering biking to work, here are a few tips for the newbie bike-to-work crowd. Try them out during a Bike to Work Week event in your area. If you’re an organization raising awareness about clean air, there are tools and resources you can use to improve your marketing initiatives. Enlist the power of video to spread your message and engage your constituency. Individuals and organizations are voicing their opinions about clean air on YouTube and you can, too, via the YouTube for Nonprofits program. Update your AdWords and other marketing campaigns to include ads and keywords related to Clean Air Month and the initiatives and events you have underway. If your org is involved in Bike to Work Week, be sure to include ads and information in your ads and link to your org’s page with more detail. If you have specific tips, advice or questions about managing your Google Grants AdWords account for Clean Air Month or another cause, visit our discussion group and see what other grantees have to say. May is Clean Air Month in the US, and as it comes on the heels of the recent oil spill in the Gulf of Mexico, people around the country are paying even closer attention to air quality and what they can do to improve it.